If you live in the Greater Boston area, you probably are well-acquainted with the three phenomena that are guaranteed to accompany the arrival of fall in New England: the annual migration of drunk college students, clogging the archaic transportation system, the reappearance of annoyingly-outspoken Patriots fans and Boston Hassle Fest. Yesterday, BRAIN Arts Org. 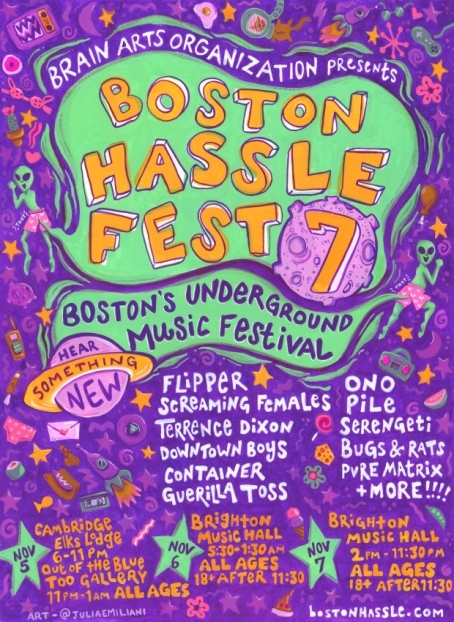 unveiled their Indiegogo fundraiser campaign for this year's Hassle Fest, offering much-needed respite from "Free Brady" t-shirts lining the Boston city streets. This year's lineup boasts over 50 bands, with the likes of Pile, Downtown Boys, and Guerilla Toss serving as the welcoming committee for major headliners Screaming Females, Flipper (with David Yow) and Terrence Dixon. The Indiegogo campaign is the only way to secure advance tickets to any fest performance, so make sure to donate early and guarantee your presence at BRAIN Arts Org. 's biggest annual event. For more information about Hassle Fest, click here.